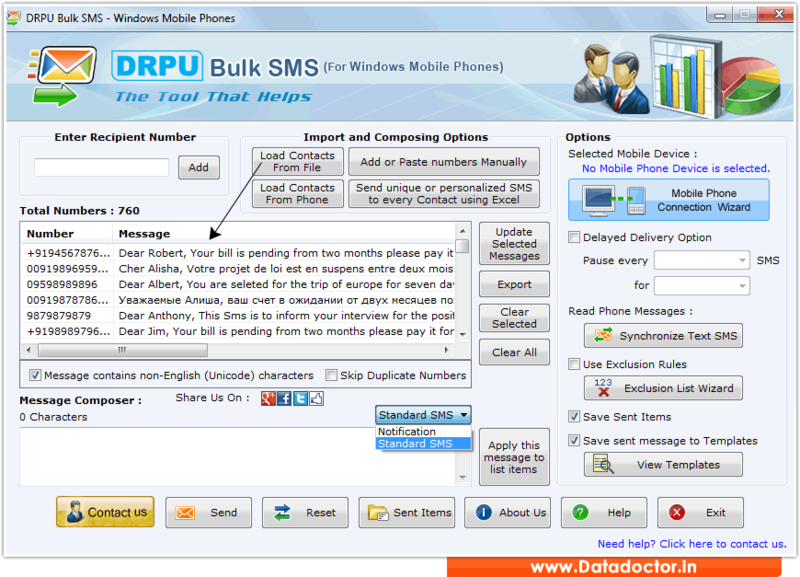 Bulk SMS Software for Windows Mobile Phones sends bulk text messages including personalized or targeted SMS messages, event and job alert notification, promotional or marketing campaign etc instantly to individuals or group of people from your Personal Computer to all mobile phones via using any Windows based pocket PC, PDA and smart phone handsets. » If your PC is running Windows Vista, your synchronization settings will be managed through the Windows Mobile Device Center. » If your PC is running Windows XP, or earlier, your synchronization settings will be managed through Microsoft ActiveSync. » Import phone number list from Text file/Excel file format saved in PC or from phone memory. » Advance option to send Notification or Standard SMS. » Compatible with all Windows based Mobile Phone handsets supported by Microsoft ActiveSync and Windows Mobile Device Center. » Sends unlimited messages of seasonal greetings, emergency news and warm wishes etc to all your friends, relatives, family members easily. » Support both national and international mobile network service provider to send bulk SMS.